-Spider webs, dripping with dew, hanging between palm fans, light within, light behind. -Sunlight shining through tree leaves. -Broken reflections of trees in dark, blue-tanin-coloured water, transparent, ripples reflecting sky, fish swimming below, among the cloud reflections. -Refracted light on walls from antique, rolled glass window panes: trees and leaves and shadows, rippling with light and dark shapes. -Light diffused on children’s faces: seeming to come from within, rather than reflected from without. 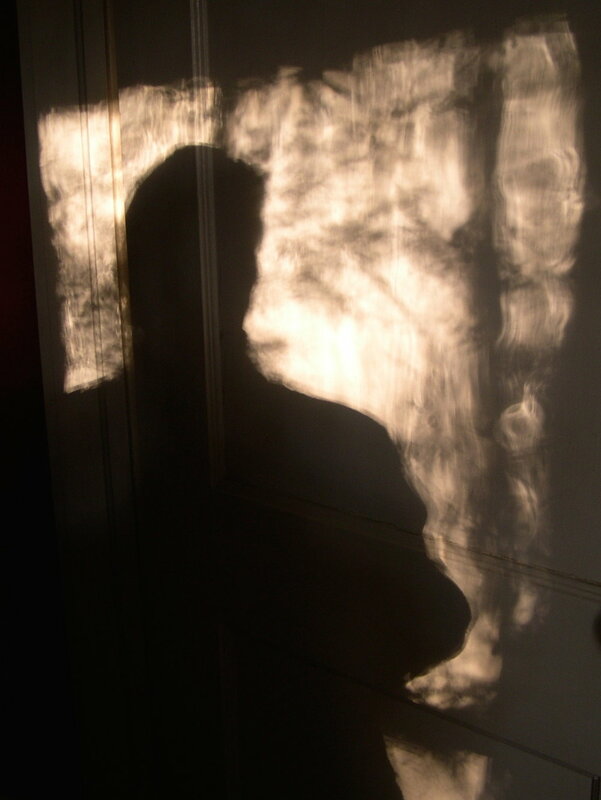 -The light inside the house at sunset: the light through the window at sunset. -The light within the waves at the beach, where the wave curls over to meet the wave before it, the wave behind, rearing up to takes its place in the rush toward land. -Reflections/refractions of glass-walled buildings: distorted echoes of light. -The light in the West when standing on the beach, immediately after the sun has set: the light in the East, at the edge of the sea horizon after the sun has set. -The colour of light at the horizon, under the clouds: the colour of light, above the clouds. In the winter, the horizon is pale-aquamarine; above, a light ultramarine-blue. Two blues in the same sky. The sky overhead, a darker ultramarine. Three blues in the same sky. -The light within clouds; the light on the edges of clouds; the light “rayning” down from cloud “cover” in bands of shadow and beams of light, like rain. -Crepuscular light: sun rays behind clouds in late afternoon. -Auras surrounding heads/hair of animals, humans, ornamental grasses, etc. when the sun is behind the object. -The light of the sun that strains to be seen on overcast days. -The difference in light: in New England vs. the light in Florida; the light in Paris vs. the light in Provence; the light in Beijing vs. the light in Hong Kong. -The reflection of a cloud in the Pacific Ocean off the big Island of Hawaii; the reflections of clouds in Lake Sante Fe, Florida, seen from a low flying airplane. 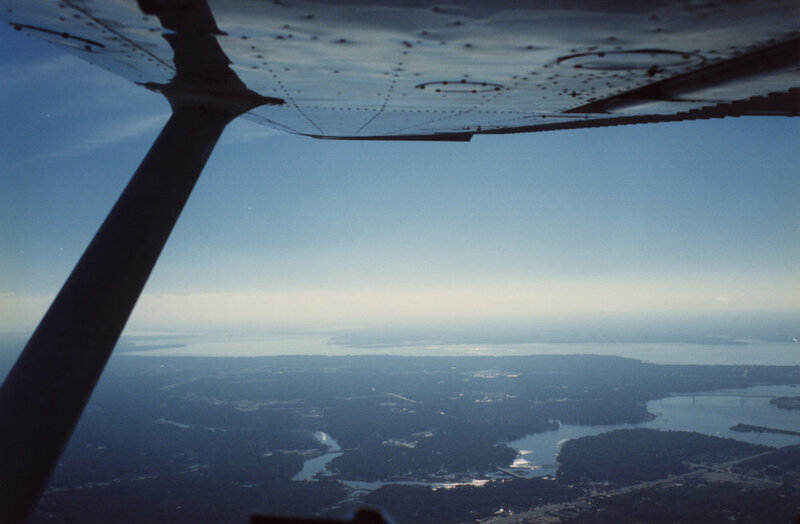 -The changing light on lakes, rivers and ocean from high altitude while flying. -The light of unfamiliar stars over the South Pacific : the total blackness of the ocean below, when flying from Argentina to Bolivia. -The light through crystallized air on tree branches and on marzipan-coloured buildings in St. Petersburg, Russia in December: day and night. -The light all around on the air approach to Baltimore over the Harbor, late afternoon, with scattered rain showers, large cumulonimbus clouds, broken by shafts of sunlight, reflections on the water: many shades of grey: blue-grey, brown-grey, light brown-yellow-grey haze. -The light, facing West, in mid-morning, flying over the English Channel at high altitude, the sea, beyond: mixture of every kind of cloud, with rain, fog, incandescence. -The light within Venice at every time of day. -The light in the Blue Mosque in Istanbul. Dry light in Konya. -The coloured stain-glass light in St. Chapelle, Paris. -The light, flying south, in clear air, over the ocean at 2500 feet (at the same altitude as the clouds), adjacent to the East coast of Florida, racing rain showers from St. Augustine to Flagler Beach on a January morning. -A phenomenon of light atmosphere, everything bathed in green light: all-encompassing, bright green mist, seen to the South, while driving west, past Shelburne Falls, Massachusetts on a late Fall day. Only there; only that one time. No light phenomena (and, each, is a unique phenomenon) are ever repeated in the same way, to the same intensity. At times, it seems light can pass right through me, and I become the light. At other times, it is running away in the distance. Sometimes, it bears down on me like a heavy weight: solid. The light in, and of, intimate spaces has a completely different quality from the light of exterior spaces. The light at Memorial Park, influenced by the elliptical grassy, central space with its juxtaposition to the open horizon beyond, filled with sky and the immense St. Johns River, liberates! Everyone responds to this unencumbered light space with joy: dogs run after frisbees and balls, ears flapping; children run and chase, laughing; grown men play ball games with the virile energy of competitive exuberance; couples lie in the grass, and read, and love; fishermen watch water reflections for fish ripples, gazing at the tidal movements in the river, children on scooters and bikes chase shadows on the sidewalks, blinking at the sunlight as they approach the Memorial statue with reflections from the river, beyond. And then, there is the light within a loved one’s dying eye. It blazes, pure aquamarine blue, the light, behind: then, suddenly, a final cloud passes over it, and it is gone. But, the memory remains of the light and how privileged I was to have seen it. And, all the other light of my life experiences.